Lawrence Krauss's provocative answers to these and other timeless questions in a wildly popular lecture now on YouTube have attracted over a million viewers. The last of these questions in particular has been at the center of religious and philosophical debates about the existence of God, and it's the supposed counterargument to anyone who questions the need for God. As Krauss argues, scientists have, however, historically focused on other, more pressing issues—such as figuring out how the universe actually functions, which can ultimately help us to improve the quality of our lives. In his new book, a cosmological story that rivets as it enlightens, pioneering theoretical physicist Lawrence Krauss explains the groundbreaking new scientific advances that turn the most basic philosophical questions on their heads. Lawrence M. Krauss, a renowned cosmologist and popularizer of modern science, is director of the Origins Project at Arizona State University. Hailed by Scientific American as a rare public intellectual, he is the author of more than three hundred scientific publications and 8 books, including the bestselling The Physics of Star Trek, and the recipient of numerous international awards for his research and writing. He is an internationally known theoretical physicist with wide research interests, including the interface between elementary particle physics and cosmology, where his studies include the early universe, the nature of dark matter, general relativity and neutrino astrophysics. He received his Ph.D. in Physics from MIT in 1982 and then joined the Harvard Society of Fellows. In 1985 he joined the faculty of Physics at Yale University, departing in 1993 to become Chairman of the Physics Department at Case Western Reserve University until 2005. In 2008, he joined the faculty at Arizona State University. Krauss is also one of the few prominent scientists today to have actively crossed the chasm between science and popular culture, for example, performing solo with the Cleveland Orchestra, narrating Gustav Holst's The Planets at the Blossom Music Center in the most highly attended concert at that venue, and receiving a Grammy nomination for his liner notes for a Telarc CD of music from Star Trek. "Measuring Mythology: Startling Concepts in NCCAM Grants," a recently published* study of twenty years of grant awards by the National Center for Complementary and Alternative Medicine (NCCAM), one of the centers of the National Institutes of Health (NIH), will be discussed by the study's authors, Eugenie V. Mielczarek (Emeritus Professor of Physics, George Mason University) and Brian D. Engler (CDR US Navy, Retired) on Saturday, February 11 at 1:30 pm at National Science Foundation in Arlington. I want to thank those of you who responded to our year-end appeal. We raised several hundred dollars in donations and a gratifying number of former memberships were renewed. This will greatly help us meet our commitments for the new year. I hope to see you at our anniversary events this spring, Drinking Skeptically gatherings, or monthly talks. I have access to the "raw" (i.e., prior to processing) LROC images at Goddard, as received from LRO via the ground station at White Sands Complex in New Mexico. If there is a hoax, it's extremely unlikely that the perpetrators would expect anyone at Goddard to bother looking inside the images there. That's the job of the scientists, students, and staff at Arizona State University (ASU) who receive the files after they're transferred from Goddard. I downloaded NACview onto an old LRO Mac at Goddard, invoked the program and...it didn't work. After some troubleshooting, I was able to at least get an error message displayed. My web search, using keywords from the message text, turned up a plausible explanation which I sent to the NACview developer. He kindly recompiled the program so it would work on the older Mac operating system version I was using, and...it still didn't work, though no error message appeared. I and the developer then compared some of the contents of the raw NAC file I was using with its ASU counterpart. They didn't match. Before getting too suspicious that I had found my "smoking gun" of a doctored NAC image at ASU, I contacted a colleague who explained that the raw images at Goddard are "more raw" than the ones at ASU. The Goddard images are exactly as received from LRO's solid-state recorder. The recorder receives an image from LROC, transferred in segments, via an interface ("SpaceWire") that can accommodate the camera's ability to produce an enormous amount of image data in a very short time. SpaceWire transfer protocol requires a "header" on each data segment that comprises a full LROC image. The headers of each segment are still inside the image file on the recorder and at Goddard. They're automatically stripped out when the images are conveyed to ASU. I located the program to strip out the SpaceWire headers, used it on the raw NAC images of the Apollo landing sites, and invoked NACview again. It worked! After adjusting NACview's brightness and contrast controls, I saw a cratered terrain typical of the lunar surface. But I still had plenty of work ahead to find Apollo artifacts in the images. What was the scale and orientation of each image as compared to its publicly released processed counterpart? I scrolled through the enormous raw images, adjusting the zoom setting and even inverting the horizontal and vertical displays to try to identify a group of craters or other features visible in both raw and processed images that I could use for determining the location of the Apollo lunar module descent stage or other equipment in the raw image. It was a daunting task. Eventually, while scrolling through a raw image that contained the Apollo 12 landing site, I spotted the footpaths of the astronauts. It's a uniquely looping and multithreaded feature, different from the mostly straight and single trails left behind by boulders likely set into motion by meteorite impacts. 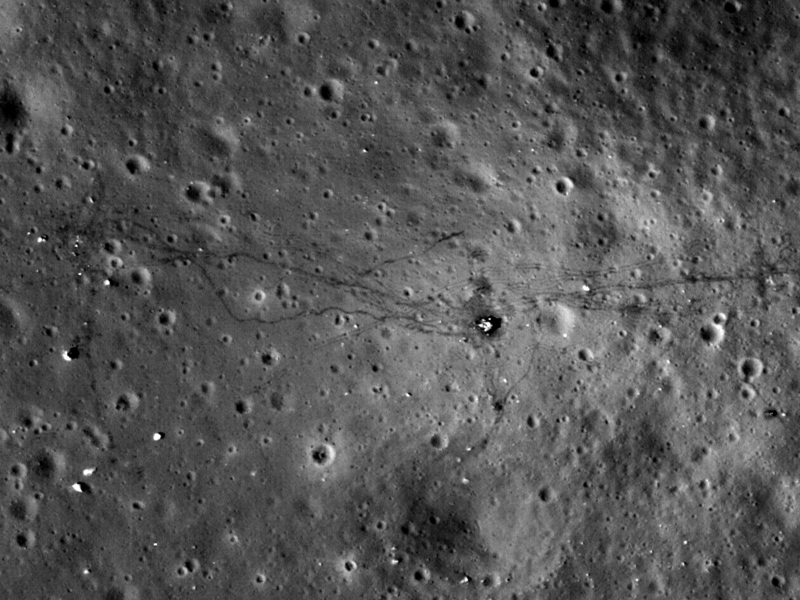 I was able to use the footpaths (and lunar rover tracks for Apollo 17) to locate the sites in the raw images. This appears to be an excellent match with the publicly released version. If there's a hoax, and it involves doctoring images to show Apollo artifacts, the doctoring process is already completed in the raw image that arrives at Goddard from LRO via White Sands. In Part 1 of this article, I concluded that there isn't enough time for someone to intervene en route in order to doctor an image with phony Apollo evidence. However, I didn't consider the possibility that a previously prepared fake might be substituted for a genuine image in the data stream, presumably somewhere between White Sands and Goddard. Unfortunately I can't check this possibility because I don't have access to the White Sands Complex (WSC). In defense of the good reputation of WSC personnel, I can point to occasional technical difficulties caused by high winds affecting WSC antenna pointing, or caused by precipitation that disrupts the high-bandwidth "Ka-band" channel used for downlinking LROC files from the LRO recorder. By all appearances WSC does seem to be relaying actual spacecraft data, in good times and bad. Does WSC retain a group of Photoshop artisans who are inserting fake Apollo images into the LROC data? I find that very hard to believe, but I can't easily check the possibility. Nor can I easily verify that the LROC data are coming to Goddard directly from WSC. The ground system logs confirm this, but conceivably the network addresses could be spoofed well enough that a non-expert like myself would be fooled. However, the LRO Mission Operations Team includes system administrators who would probably be able to detect a deception of this kind, or otherwise would probably have to be in on the hoax. Such a conspiracy would have to include the new hire who replaced his predecessor. The conspiracy, if it exists, would be expanding. That would pose a problem for maintaining the secret. Meanwhile, by splitting this article into two parts and making sure that Part 1 was a topic of conversation at work, I did my best to provoke any conspirators into a nervous mistake. Could they be sure how close I might come to the truth? Yet, during the interim month, I saw no evidence of tampering with the images of interest. (Just in case, I copied them onto a separate ground computer system and obtained a distinctive "checksum" value for each file. Modifying the files without changing the checksum value would be extremely difficult.) I also never noticed anyone following me. My car didn't have a catastrophic failure while I was behind the wheel. No pianos fell on me. I guess the conspirators were very confident I'd find the answer they wanted me to find. Or I'm one of them. In late December 2011, Apollo Moon hoax advocate Jarrah White posted videos critical of the recent (August 2011) LROC images. Judging by the humorous aspects of the videos, I wasn't sure at first if White wanted anything in them taken seriously. But clearly he does. Interested readers can see for themselves from these videos how the "conspiracy game" can be played. Provocative questions are posed, but then no attempt is made to get informed answers from the LROC scientists. Since the game's rules of logic are loose and subordinate to provocative claims, I can play the game by wondering why anyone is claiming that the Apollo Moon missions were hoaxes. Are the claimants just in it for attention, for money, or for darker purposes? And just how do they find the time and money to do their "research?" Could they be supported by governments or other organizations that are hostile to US interests? Rightfully the Apollo Moon missions are a matter of great pride to Americans, and likely to engender respect and admiration from around the world. Unless, of course, the authenticity of the missions can be discredited. So there's a motive and no shortage of suspect governments and organizations to back such an effort. Jim Hawks, remarking on Moon hoax claims in general, asks why NASA would've gone to the trouble of hoaxing several instances of Apollo astronauts stumbling, falling, and getting back up (often with great difficulty) while wearing bulky spacesuits in the Moon's low-gravity (one-sixth of Earth's) environment.